As a small business owner, you often wear many different hats. Salesperson, accountant, human resources…SEO strategist? You know the importance of marketing’s role in increasing foot traffic and phone calls, and that includes search engine optimization. Yet, SEO is often the least understood marketing discipline. And many time-pressed business owners struggle to make sense of the large amount of information available about SEO. Don’t give up! Four out of five consumers use search engines to find information about local products and services, according to this study. In this article, I’ve highlighted a few ways to jumpstart your own local SEO strategy. In July of 2014, Google pushed out a major update to its local search algorithm. Coined the Pigeon update by Search Engine Land, improvements were made to Google’s distance and location parameters, which impacts both the organic rankings and Google Maps. The proximity of a search engine user’s location to a business’ physical address increased significantly in importance as a local search ranking factor, practically overnight. It’s never been more important to optimize specifically for local results if you want to increase the chances of customers finding you online. But before diving into local SEO strategies, let’s a take a closer look at what these local results actually look like. The list of businesses is often referred to as the Local Pack or 7-Pack. These listings are populated by Google business pages, and usually include seven spots. Since the Pigeon update, however, many local packs have shrunk to three spots or less. But wait, there is more. Certain queries, particularly for restaurants and hotels, return an entirely different looking result. Note the lack of contact information. Users can even filter this result by customer rating, price and more. Confused yet? Don’t worry, I’ll show you how to optimize for these listings below. 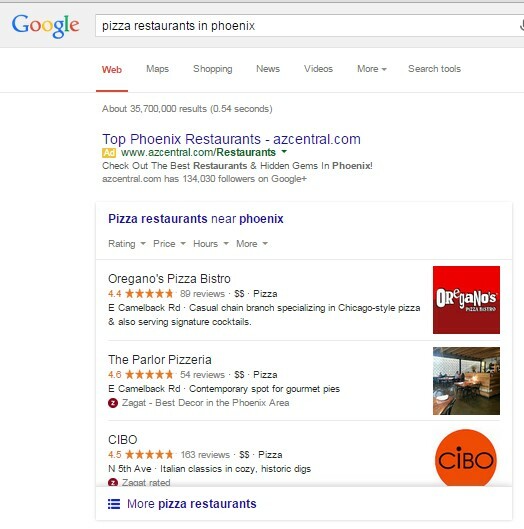 Action Takeaway: Search your primary keywords, and make a note of your current visibility in the local results. Use an incognito browser window to avoid seeing personalized results. A citation is any reference to your company’s name on the internet. Citations represent the unique online footprint of a business, helping potential customers find information about you. A complete citation will include your business name, address, and phone number (NAP). These are often called structured citations, which refer to the standardized business listings most commonly found on online directories and review sites (e.g. Yelp.com, Yellowpages). They almost always include a link. Your NAP must be consistent across these listings. Search engines often rely on NAP consistency to determine your location and deliver accurate results to users. Even small inaccuracies like a missing suite number can be detrimental to your rankings. A common question revolves around abbreviations (suite vs ste) and what should be used. The answer is: businesses should be as consistent as possible about using abbreviations, but search engines are smart enough to understand common variations. Instead, shift your attention to higher priority inconsistencies, such as incorrect phone numbers. Action Takeaway: Write down current and previous NAP information to cross-reference with all mentions of your company throughout the web. A Google Business page should be your highest priority structured citation. Google My Business (GMB) is a service that integrates Google search, Maps and Google+ into a single dashboard, making it easier for a business to update its information across all platforms. The information in this dashboard directly influences what is shown in local search. A well-optimized Google Business page is absolutely necessary for strong local pack rankings. Storefront: For business who serve customers at a brick-and-mortar location. Service Area: For businesses without a storefront who serve customers at their location within a specific service area. Think: plumbers or moving companies. Brand: For organizations that don’t have a physical storefront or provide local services, but still want to connect with fans and customers on Google. Follow these steps to create or claim your Google My Business page. Click Get on Google, and sign-in to your Google account or create one. Search for your business name to see if page already exists. Search your name and address together to be sure. 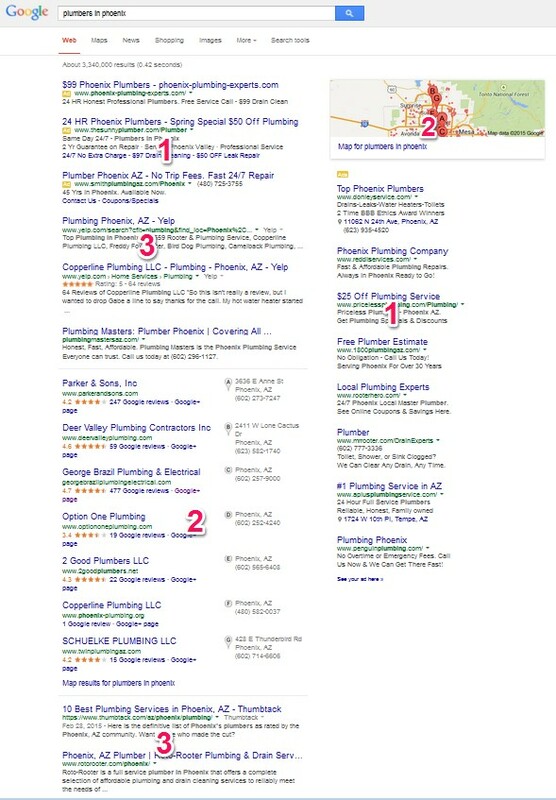 If your business doesn’t appear on this list of results, select None of these match. Add your business, or click on the gear icon in top right, and select Create new page. Follow the proceeding steps to enter your pertinent business information. After creating your page, you’ll be given the option to verify it. Verification is necessary for your page to appear in Google Maps. You’ll receive a physical postcard within 1 to 2 weeks with a verification code to enter on your account. Don’t forget this step! Name: Special characters or legal designations (e.g. LLC) aren’t allowed unless they’re part of your usual branding. Description: A unique description that avoids keyword stuffing. Don’t just copy and paste text from your website. Address: Service area businesses are required to hide their address in Maps. Designate the areas you serve by entering zip codes, cities, or a radius. Phone: A local phone number is preferred over an 800 number. Hours Of Operation: Do you offer 24/7, “emergency” service? Set your hours to 12 am to 12 pm, Monday through Sunday, so customers know you’re available after regular business hours. Categories: You can choose up to five, but Google recommends narrowing down to as few as possible. Stick to categories that best describe your overall business model, instead of attempting to list every product or service. Photos: This is an opportunity to make a strong first impression to potential customers. Not only should you upload a quality profile and cover photo, also consider investing in a virtual tour. Action Takeaway: Create, verify, and optimize your Google business page. Popular directories were given a boost in rankings by the Pigeon update. 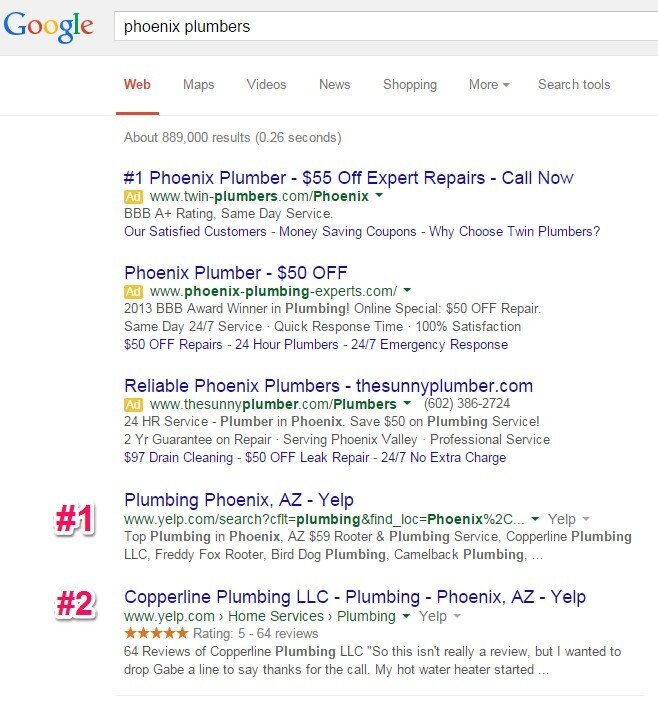 A well-optimized directory listing often rises to the top of the results as seen in the examples from Yelp below. This doesn’t include local or niche directories (e.g. Tripadvisor for hotels, Angie’s List for home services). Locate these by searching your primary keywords, and make a note of which rank on the first few pages. Action takeaway: Create or review your listing on all major directories. Find and remove any duplicates. Unstructured citations are other mentions of your business on websites that aren’t standardized directories, such as local newspapers or blogs. These may or may not include complete NAP, or a link to your website. Unstructured citations are a significant opportunity to increase local brand awareness, while sending positive ranking signals to search engines. Sponsor a charity organization or special event. Post open positions on a local job board. Seek inclusion on local government websites. Action Takeaway: Pursue mentions on authoritative local, non-directory websites. Data aggregators compile business information from various online and offline sources. They feed this information to a significant number of local directories who use it populate their listings. Inaccuracies from data aggregators is a serious detriment to your NAP consistency, so take the time to submit and review your information with these four major providers. This step can ultimately save you the headache of manually updating hundreds of less significant directories. Action Takeaway: Submit your business information to the four major data aggregators. A local SEO strategy isn’t complete without a thorough review of your own website. Here are a few best practices to get started with. Set up Google Analytics and Webmaster Tools, if you haven’t already. These free tools provide valuable insight into your website’s traffic. Update-to-date NAP should be present on all pages. Make sure this information is located within the text, not as an image, so the search engines can also see it. Page titles and meta descriptions tell search engines and users what your pages are about. Watch this video to learn how to optimize them properly. Each one must be unique. Take the necessary steps to optimize your website for mobile visitors. Action Takeaway: Optimize your website for local visitors. Frequently monitor your traffic in Google Analytics. Let’s recap your new local SEO strategy with this handy checklist. 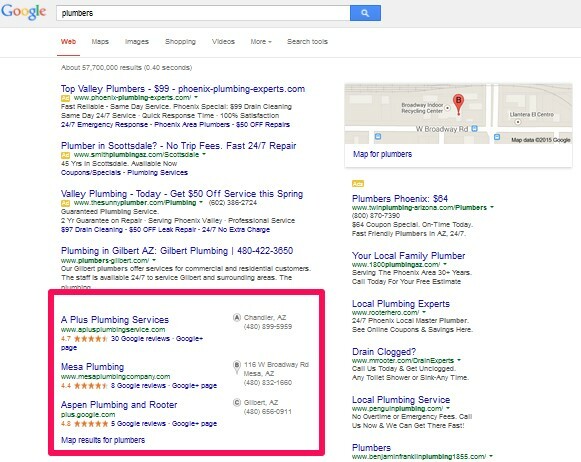 Search your primary keywords, and make a note of your current visibility in the local results. Use an incognito browser window to avoid seeing personalized results. Write down current and previous NAP information to cross-reference with all mentions of your company throughout the web. 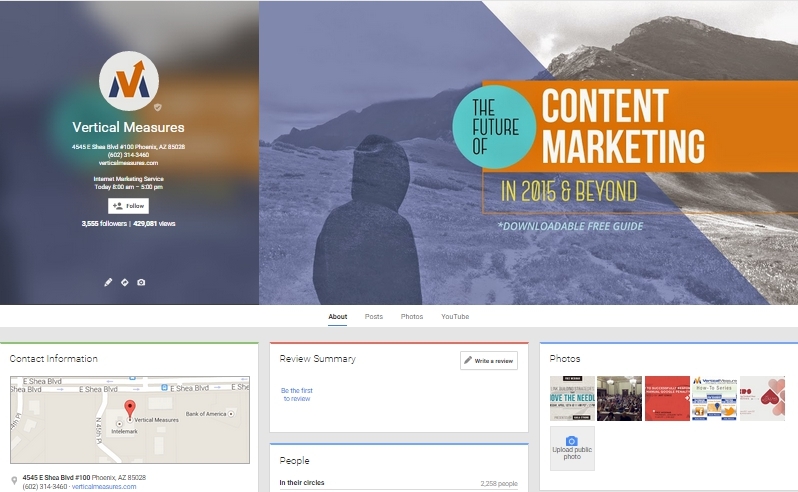 Create, verify, and optimize your Google business page. Create or review your listing on all major directories. Find and remove any duplicates. Pursue mentions on authoritative local, non-directory websites. Submit your business information to the four major data aggregators. Optimize your website for local visitors. Frequently monitor your traffic in Google Analytics. Following through on these steps will put your business in a great position to stay ahead of competitors. And as always, SEO works best when combined with an integrated PPC, social media and content marketing strategy. Questions or comments? We’d love to hear from you in the comments below. This article was written by Andre Willis from Business2Community and was legally licensed through the NewsCred publisher network. Next articleResumes And ATS: What Does It Mean For You?